The power supply is usually the most overlooked element in buying a computer, but it is a very important consideration. When a computer fails it is often a deficiency in the power supply that directly or indirectly led to the failure. Power supplies use a component called a "capacitor" to smooth out the DC current that goes to your computer's motherboard and other components. Capacitors gradually degrade over time; they degrade faster with elevated temperatures and elevated workloads. Larger wattage power supplies have higher ratings for their capacitors which helps them to last longer in lighter duty applications. If the computer draws 250 watts normally, a power supply of at least 500 watts would be the smallest one to consider. 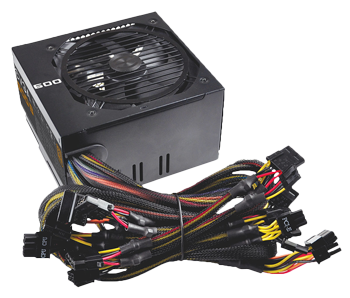 If you want it to last a long time, a power supply of more than 600 watts would be much better. Also, the initial power surge when the computer starts requires a larger power supply. After the consideration of wattage comes the maximum current that can be supplied by the 12 volt circuit. This is critical in distinguishing a good power supply from a low quality power supply. 12 volt circuits are sometimes divided into multiple smaller voltage circuits called "rails". For a trading computer, I would recommend no less than 38 amps for the 12 volt circuit and no less than 20 amps for each rail, if there is more than one rail. It is preferred to have more than 45 amps total capacity on the 12 volt circuit because many of the better processors and video cards have a high instant starting current. This may trigger the overload safety device when you try to start your computer.